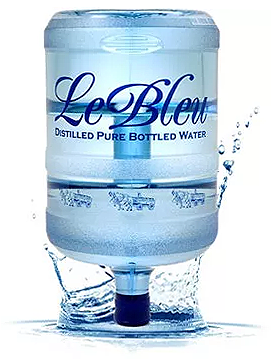 We offer our ultra pure Le Bleu water in a variety of multi-gallon jugs and water bottle sizes. Whatever size suits you, you can rest assured that all bottled water we deliver is the same ultra-pure H2O – 11% hydrogen, 89% oxygen. Nothing more. Nothing less. No chemicals, no sodium, no chlorine, no pharmaceuticals, no bacteria, no viruses, no microorganisms. Whether you rent a water cooler from Le Bleu or have your own, we can deliver 3 and 5 gallon jugs to you. Like all Le Bleu Ultra Pure Water products, our multi-gallon water is bottled in a non-toxic, BPA free container which won’t leach contaminants of any kind into our water under any circumstances. Our 3 and 5 gallon jugs also feature sturdy handles for easy replacement. Our three- and five-gallon water jugs are ideal for many homes, offices, and events— but sometimes you can’t beat the convenience of individual 12- or 20-ounce bottled water. 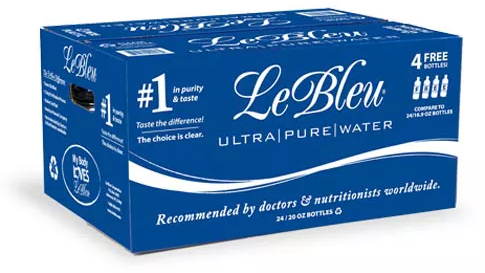 Le Bleu offers scheduled delivery of our standard and premium Le Bleu Ultra Pure water in 12- and 20-ounce bottles, by the case. And our custom, private-label water is an excellent choice for special events and marketing your brand. Currently, Home and Office Delivery is available in Western Tennessee, Virginia, South Carolina, North Carolina and the Caribbean Islands. Enter your address to find the closest Le Bleu location.